Safeguarding the health and safety of workers and the public is a cornerstone of all oil and gas operations, including hydraulic fracturing (fracking). Statistics from workers’ compensation boards across Western Canada show that the (oil and gas) industries indicate steady and significant improvement in the claim rates. Average claim rate (both Lost Time and Total Claim Rate) has been consistently declining year over year and has fallen by 70-90 per cent since year 2001. Safety in Canada’s oil and gas industry is highly regulated and all operations, including fracking, are covered by stringent safety regulations. The industry is held accountable by regulators. In Alberta a publicly available online dashboard highlights non-compliances – including company names – that have the potential to impact public safety or the environment. The Petroleum Services Association of Canada (PSAC) participates in the Partners in Industry Reduction program in Alberta, and Partners in Injury & Disability Prevention in British Columbia. PSAC requires all its regular members, including frac companies operating in Canada, to have a Certificate of Recognition (COR) indicating that they have a safety management system in place that meets or exceeds provincial standards. The COR program is proven to improve company health and safety performance, create a culture of proactive workplace health and safety, and reduce the risk and costs associated with workplace incidents. Small Employers Certificate of Recognition (SECOR) and Medium Employers Certificate of Recognition (MECOR) have been developed to ensure that company size is not a barrier to implementing a proactive, effective health and safety program. Enform is the certifying partner of COR for the oil and gas industry. 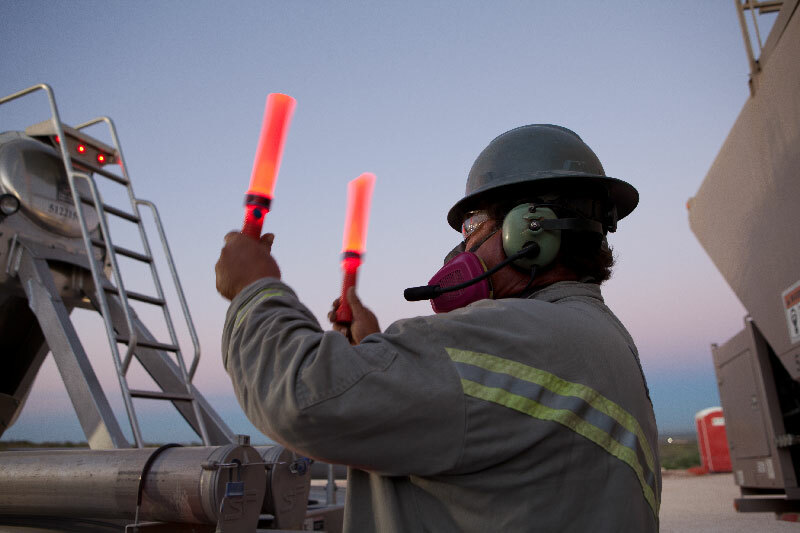 A highly skilled and well-trained workforce is important for ensuring the people and environment close to frac operations are safe and protected. The workforce is also crucial to achieving technical and economic success for a frac company. Frac operators are responsible for driving, operating and maintaining millions of dollars’ worth of equipment – often in extreme weather conditions. It is in the company’s best interest to ensure that an employee has the skills and knowledge required to carry out the company’s operating, safety and environmental procedures. Many of Canada’s frac companies have training facilities and extensive internal training programs that involve classroom and on-the-job training, mentoring and computer-based and simulation technology. If new hires do not already have all the regulatory-required certification, most companies will provide the training or support them to take the training through Enform. Industry Recommended Practices (IRPs) for fracking have been developed through Enform’s Drilling and Completions Committee (DACC). IRPs that deal with fracking are designed to provide guidance and best practices for conducting the fracking process in a safe and technically acceptable manner so that they meet, or exceed, regulations. The industry also works with Enform to develop IRPs and training to increase workplace safety. For example, the control of silica dust is a workplace issue directly related to fracking. The increased use of sand during frac operations has elevated the potential for workers to airborne silica dust and the associated health risks from inhalation. 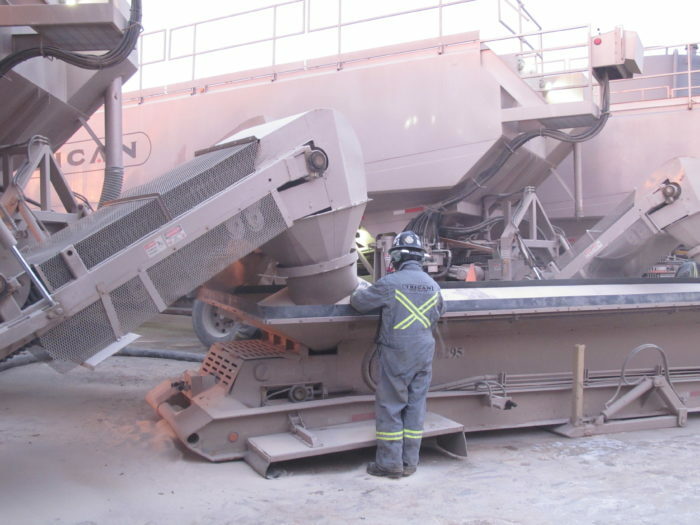 The Silica Exposure Control Plan (ECP) provides companies with a number of tools and resources to assist with implementing control strategies, with the goal of those strategies becoming normal industry practice. Health, Safety and Training is one of five commitments included in PSAC’s Hydraulic Fracturing Code of Conduct developed by a collaboration of frac companies. Regulators require all oil and gas companies to establish and maintain ERPs for all of their operations, including fracking. A worker in Alberta’s oil and gas industry is more likely to miss work due to an on-the-job injury than workers in other industries. A Lost Time claim occurs when an occupational injury or disease disables the worker beyond the day of injury. 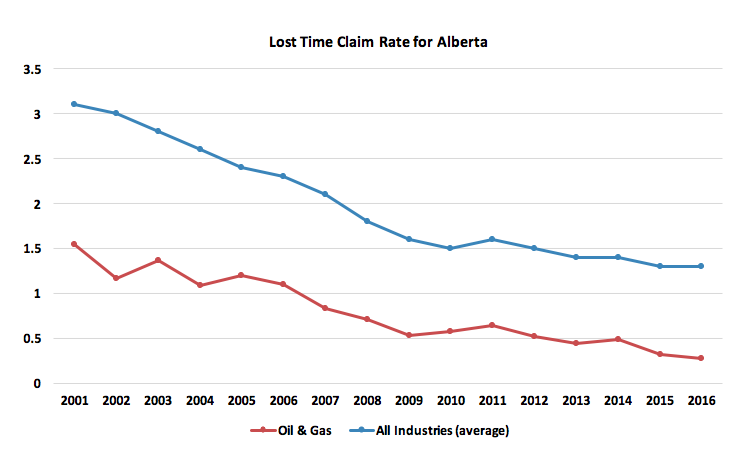 The Lost Time claim rate for Alberta’s oil and gas industry is less than half of all other industries in Alberta.